How does Tap2Tag Medical alert work with the Diabetes community? Diabetes is one of the most prevalent and wide-spread conditions affecting the modern world today. There is an estimated 4 million in the UK living with diabetes (around 1 in 15 people) and it's estimated that around 382 million are affected worldwide. Figures from Diabetes UK estimate that this figure could rise to 592 million by 2035. Diabetes is a disease that reduces the body's ability to produce or respond to the hormone, insulin. The result is an abnormal metabolism and elevated levels of glucose in the blood. And the condition is very serious if left unmedicated and uncontrolled. There are two types of diabetes; Type 1 and Type 2. Type 1 diabetes is where the body cannot make ANY insulin at all. If you have Type 2 diabetes then it just means that the insulin you produce isn't working effectively or you can produce enough of it. Symptoms of either type of diabetes can include the need to pee more frequently, being incredibly thirsty and feeling very tired. You may also lose weight or suffer from slow healing wounds. Over prolonged periods of time higher levels of glucose in the blood can serious damage your kidneys, feet heart and eyes. WHY IS TAP2TAG MEDICAL ALERT IMPORTANT? If you have been newly diagnosed with any new medical condition it is likely that the medication you have been prescibed will change over time. Fortunately, for those with diabetes, there are some very effective treatments. These would include insulin pumps and Islet cell transplants (mainly for those with Type 1) or medication, weight loss surgery and diet & exercise. In fact many people with Type 2 diabetes can live a life without medication just by maintaining a healthy diet and exercise programme. Diabetes remains a non-visable medical condition. A patient who suffers a hypo (short for "hypoglycaemia") can experience many symptoms including trembling, tingly lips, sweating, palpitations and many more. In particular an incapacitated patient may not have time to explain to a first-responder exactly why they are feeling unwell, especially if they are unconscious. So how would someone suffering a hypo communicate their medical condition and treatment to emergency personnel? 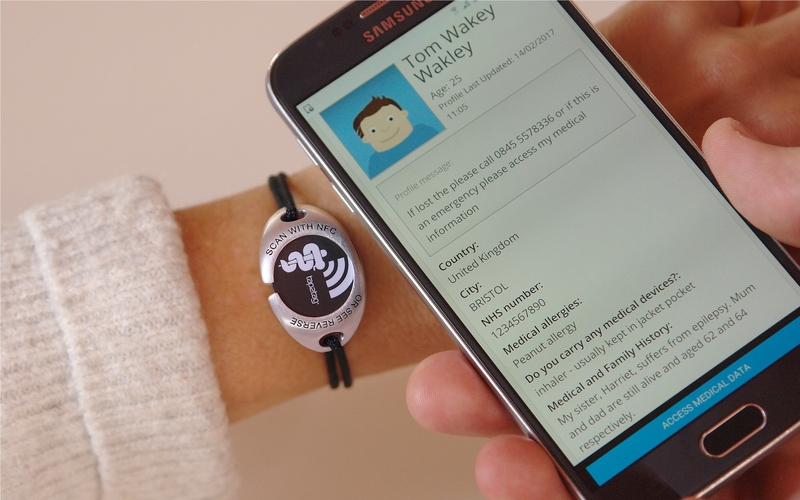 Wearing a Tap2Tag Medical Alert bracelet allows it to do the talking when you cannot. HOW DOES TAP2TAG MEDICAL WORK? 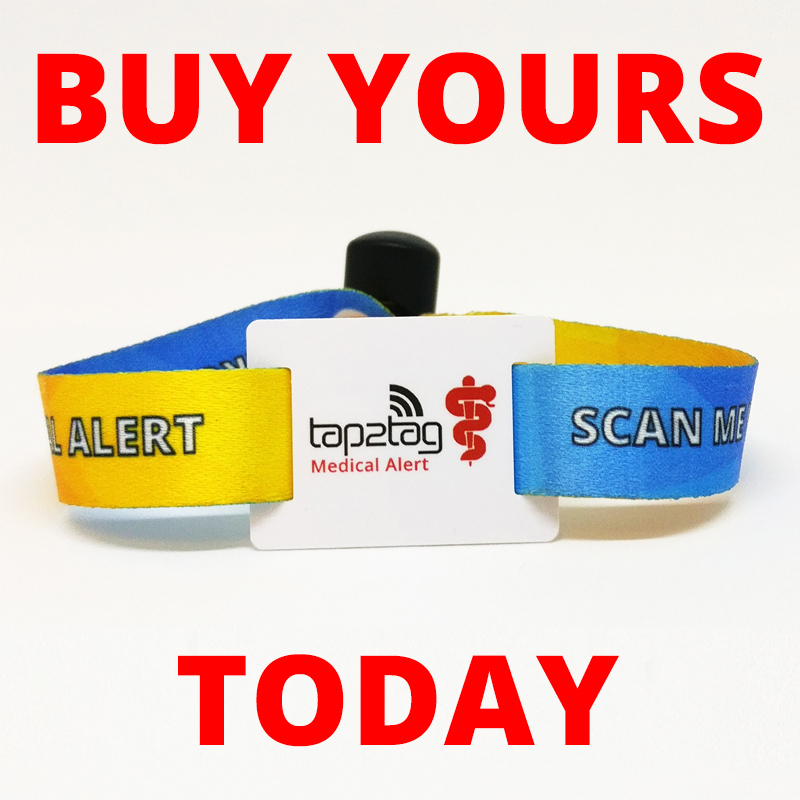 We sell medical wristbands, cards and key fobs. Each device comes with a special chip inside it. For our newer devices each product also comes with a QR code too. A paramedic or first responder simply taps their NFC enabled phone against the device and your medical information appears. There are no apps to download, the information simply appears on their phone's browser. When you buy a Tap2Tag device you need to register it at our website. Every product comes with a unique code and once registered only you can control it. A profile is the type on information you want to attach to that device. Currently you can create medical, pet and connect profiles on your account. However you can only assign a medical profile to a medical device. This ensures that you cannot accidentally assign your dog's profile to your important medical wristband! A medical profile is an extensive list of information about you and your medical information. It's exactly the kind of information a paramedic needs to treat you quickly. Here are just some of the pieces of information you can share. You can even include scanned documents within your profile such as care plans, hospital passports or copies of your prescription. It's completely up to you how much information your want to share. We also have a system we call Traffic Lights. This means that every piece of information in your medical profile can be controlled by you and this determines who can see this information. Green data means it pops up immediately on the paramedic's phone. Amber requires the first responder to login to get to more information about you and Red (Cross) is data you only want authorised medical practitioners to see. We even have a fourth category called Black Padlock, which only the account holder can see. Useful if you want to store a copy of your health insurance policy. WHY IS TAP2TAG MEDICAL DIFFERENT TO THE REST? There are two simple reasons. There is no other system in the world that offers this level of comprehensive data storage and gives you ultimate control over that information. The second is that our Tap2Tag Medical Alert service does NOT REQUIRE A SUBSCRIPTION. You can use the most comprehensive medical alert system in the world without needing to pay a subscription but, for some limited services, we do need to make a small annual charge. You can still update the information as much as you like. It's part of our mission to provide the best service possible to those that need it. It's a life saving and life changing product that already benefits thousands of people. WHO SHOULD YOU BUY A TAP2TAG MEDICAL DEVICE? Anyone with a complex medical condition would have been advised by their health professional to purchase some sort of medical alert device. If you have been newly diagnosed or living with diabetes then it is vital that you and other healthcare professionals can access your medical information quickly and efficiently. Costing from as little as £5.49 for a wristband this could give you the peace of mind. There are a number of communities that can give dedicated advice to those with diabetes. We have listed a few below. 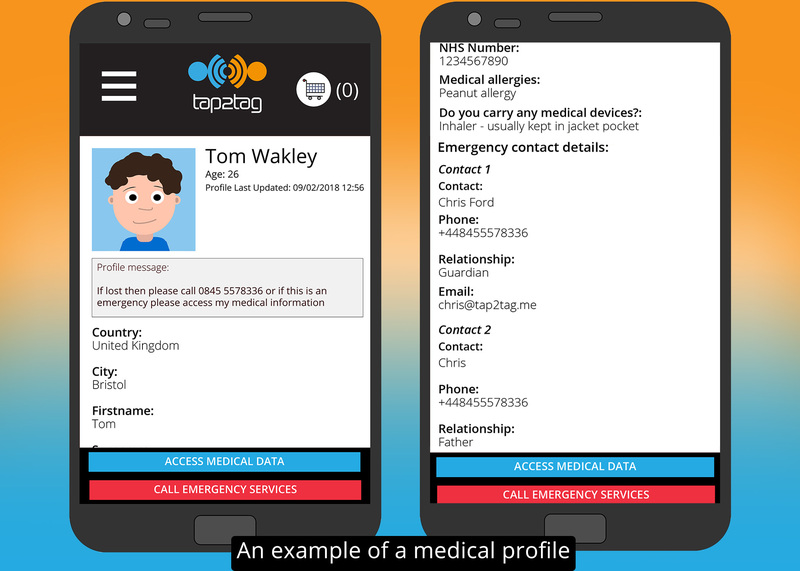 We are very proud of what Tap2Tag Medical Alert has become since we launched it in 2014. It has saved numerous lives but also changed the lives of many more. © 2014-2018 Tap2Tag Ltd. All Rights Reserved.